I try to make some caps via my mobile... sorry if it's not so clear. 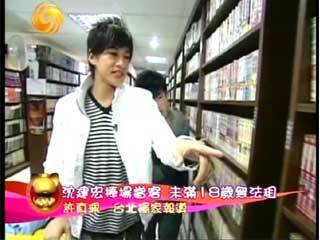 Peter is acting as a shoopkeeper of a "manhua" (comic) shop. He's just so cute when he's talking (like talking to the audience ) that he is like in a heaven because he likes reading manhua so much. Kris Shen Jianhong is coming. Peter shows him good comics. 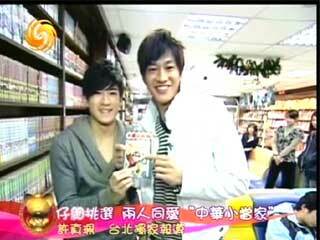 They talk about "Zong Hua Dang Jia" (Cooking Master) comic which both of them role in. Peter looks so happy around his fave things - manhua!! 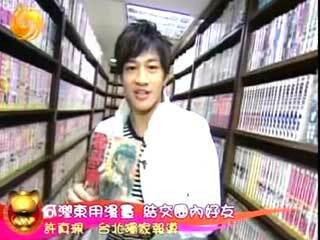 He showed his fave manhua "Punch of Wain" (?) and mentioned about Dylan Guo. Both of them read this manhua in their childhood so they have the same feelings & experience about it. 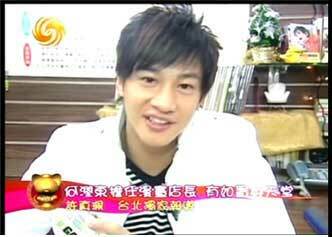 Peter also said that he enjoys reading manhua together with a friend. 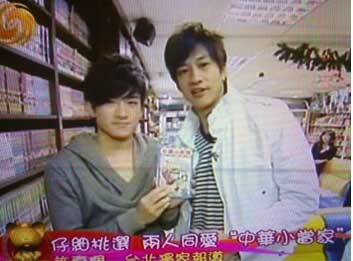 When he's filming with Eddie Pheng, he saw Eddie reading a manhua. Then he came to Eddie and read manhua together with him. Peter really wants to spend his holiday to read comics. Fang, I think the pictures are great. 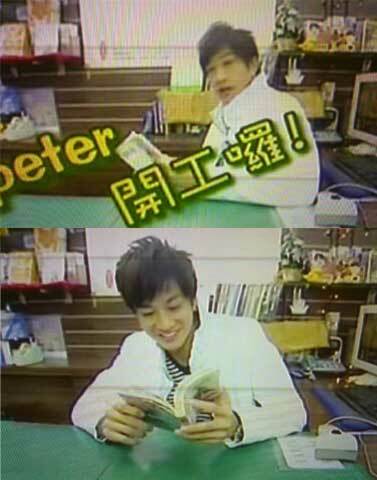 Though not very clear, but we can clearly see how happy Peter was in the 2nd picture. I really salute u for ur quick action! For Peter, it's like in a heaven......being in a comic shop! He'll be very happy if he can read comic 24 hours. Peter shows Kris, "his little bro" good comics which is suitable for his age. So many comics to read!! Our diligent comic lover feels happy to tidy up comics. pls correct any mistakes.... perhaps, banlong or tumn or other members can help I just share what I can grasp the meaning..... due to my poor Mandarin. you grasped so many good pictures! I like them! and your detailed explain too! I've translated Peter's new article. he also mntioned Punch of Wain (Bei Dou Shen Quan) in it and I've upload its cover picture.